The Caribbean reef squid is a species of squid (Sepioteuthis sepioidea) that is commonly seen by divers in the reefs of the Bahamas and the Caribbean. It is very well known for its color and body patterns. They use these extraordinary colors to communicate with one another and to confuse their prey. They are related to the Sepia officinalis otherwise known as the cuttlefish. They are a big interest to divers because of there light show and how friendly they are to people. They have ten arms and their bodies are shaped like torpedoes giving them low resistance. Their mantle (body cavity) contains their gills, ink sac, pen, reproduction and digestive system. Of their ten arms they have eight arms and two longer tentacles that they use for grabbing there food. They do this by using the suction cups on the under side of their arms. They also have two fins on either side of their head that move quickly when they are swimming. 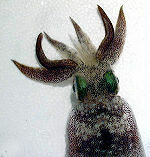 All the arms are connected to the head and make a circle around the squid’s beak which is connected to the mouth. The reproduction of a Caribbean reef squid can be very complex. After a female lays her eggs she will then die. . The male can reproduce with several females. After a male competes with several other males, the winning male gets the female. 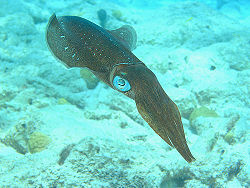 The male comes up to the female and slowly starts stroking her with his tentacles. The female will be alarmed and start flashing patterns. The male will then calm her by blowing water and swimming away. He will continue that process until the female accepts him. This process can continue for up to an hour. Once the female has accepted the male, he will put a sperm packet on her and while he is doing this he will display a pattern. The female will take the packet and will place it in her seminal receptacle. She will then find an appropriate place for her eggs, lays them, and then dies. 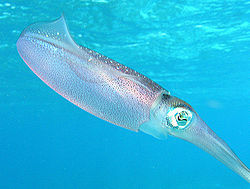 The female Caribbean reef squid lays seven to eight eggs at once. They will fully mature in 6 months. The food they consume the first ten to fifteen hours of there lives is normally mysid shrimp. After that, they normally consume smaller fish for their adult. The adults normally feed on fish and shrimp a few centimeters long. They use very tricky hunting tactics to catch their prey. When hunting, they often mimic weeds in the water to blend in. Most of there hunting is done at night. They are found throughout the Caribbean sea in the Bahamas and off the shores of Florida. Depending on the size and age they will live anywhere from open seas with depths up to 100 meters or in shallow reefs with depths up to 0.2 to 1 meters deep. Squid New world publication, 1999. This page was last modified on 10 January 2010, at 15:18.